Today, consumers are paying more and more attention to the origin, ingredients and fabrication processes of food, drink and beauty products as well as other items of daily use. The eco-consciousness and people’s desire to lead a healthier lifestyle drive the popularity of organic products. All over the world the sector is booming. Organic sales in the U.S. totaled a new record of $49.4 billion in 2017. Germany is leading the race in Europe with €10.04 billion for organic food & drink, a share of 5.2% of the country’s total consumption. In France, the organic product sales reached €8.3 billion, with 17% growth from previous year. In the UK, the sales of organic food and drink rose by 6% to a record £2.2 billion, fuelled by strong growth through independent outlets and home delivery. The highest per capita spending is in Switzerland, and Denmark has the highest organic market share (9.7%). The OTA has identified the millennial parent as organic’s biggest buyer. They are known for craving soundbite-style information but also great transparency. Millennials use several digital information sources to learn about the products they buy. Therefore, it is important for brands to make their product information clearly and easily available from different online channels. This information should be smartphone-friendly, because 84% of millennials also use their phones for shopping assistance while in a store. The shoppers of organic usually associate organic with better parenting, they are willing to pay more for organic products, and they were raised eating organic foods and taught to make organic choices. They want to know that they are not just getting a great product, but also supporting the values that these products and the persons behind represent. That is why it is important to always tie the brand stories (and the campaigns) back to the brand values and mission. In order to understand which messages and stories resonate the best, and on which channels, you need to collect data on consumer engagement rates from all your communication touch points. The millennials interested in organic products are digitally oriented and active social media users likely to share or like the information they see online. Organic product marketers must therefore actively use social media in order to get their messages heard. But not any one channel is sufficient. Brands need to use an intelligent mix of channels including social, video, website, emails etc. throughout the customer shopping path. However, in order to adjust the marketing investments wisely between different campaigns and channels, brands need to be able to measure the business results they generate each time. Inspiring the audiences and driving them to a brand website for more information is only part of the task. Engaging the consumer to purchase the products is another. Any great branding effort can turn out to be useless if at the end the shopper is left wondering where the product can be bought. And even though most of the product research is done online, millennials (as well as other age groups) still make most of their purchases offline. Indeed, 53% make the majority of shopping in brick-and-mortar stores, 31% make the majority of purchases online via desktop, and 16% make the majority of purchases online via mobile device. If you wish to maximise your chances to convert your brand audiences into sales, make both your online and offline distribution network visible and available to your customers. And make it as easy as possible for your website visitors to get to the right retailers with available products. Follow the example of Bio Planète who has just deployed Swaven’s multi-retailer POP (Point Of Purchase) solution on their website. 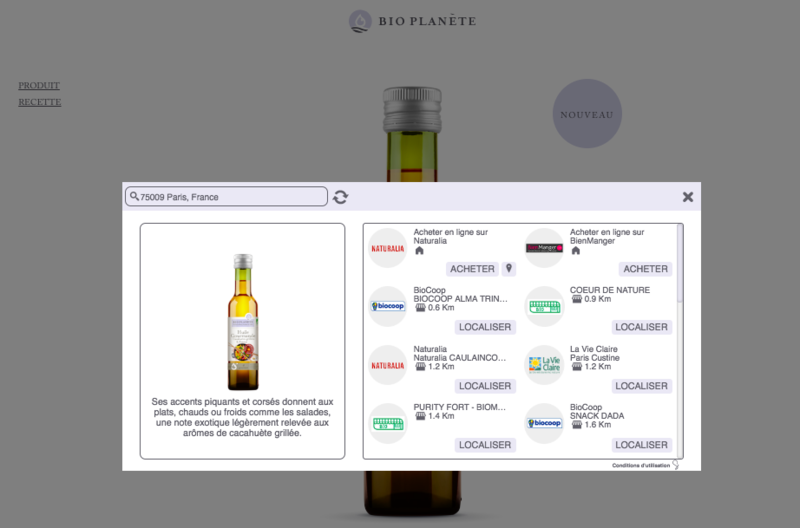 Bio Planete powered its website with Swaven’s shoppable solution. If like Bio Planète, you are interested in turning your brand contents shoppable to drive your audiences to your online and offline resellers to accelerate sales, and to measure the performance of your marketing campaigns, contact Swaven for a personalised demo.